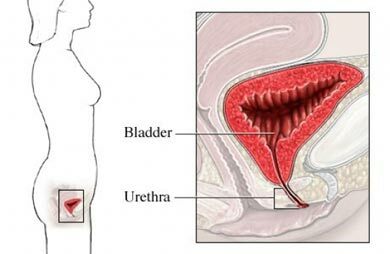 Suprapubic cystostomy is a procedure to help drain the bladder (organ that collects and holds urine). A tube called a catheter, which leads out of the lower abdomen, is inserted to drain the bladder. You may need to avoid eating for 8 hours before the surgery. If instructed by your doctor, drink only clear liquids, such as water, clear juices, tea. You may be asked to drink extra fluids to fill the bladder. Note—These steps may not be possible in an emergency situation. Local anesthesia may be used with or without sedation. You will not have any pain during the procedure. After anesthesia has numbed the area, the doctor will locate the bladder using imaging tools such as ultrasound if needed. Next, a needle will be inserted through your lower abdomen and into your bladder. A wire or sheath will then be guided into the bladder to prepare the site for a catheter. A special catheter will be placed into the bladder. The catheter will be sutured in place. A balloon may be inflated to keep the catheter in place. Afterward, the opening made in the skin (called a stoma) will be covered with gauze. You will either stay in the hospital overnight or go home the same day. You will have to restrict your activities while you recover. Follow instructions on cleaning the stoma. It will help prevent infection. The hospital staff will teach you how to change the catheter and collection bag. Aguilera PA, Choi T, Durham BA. Ultrasound-guided suprapubic cystostomy catheter placement in the emergency department. J Emerg Med. 2004;26(3):319-321. Jacob P, Rai BP, Todd AW. Suprapubic catheter insertion using an ultrasound-guided technique and literature review. BJU Int. 2012;110(6):779-784.